These are before pictures from the classifieds ad. As you can see, she was a bit rough looking on the outside. 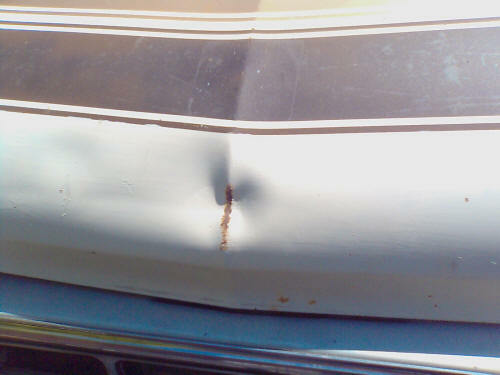 There was a fair amount of surface rust on the cab, but only a small rust hole on the front left fender. Which you can't see in these pics. Also the grill was missing several pieces, and there was a dent in the middle of the hood. But it seemed to be a good running rig. The back end had several issues that you can not see in the pictures. 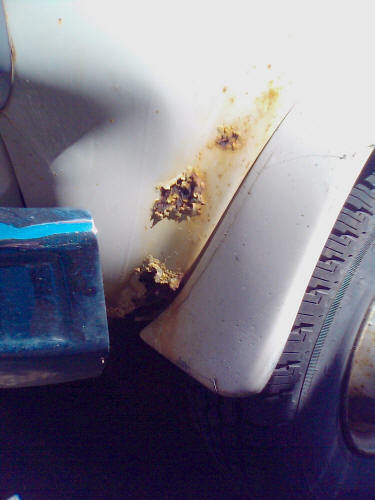 The bumper mounts on either side were badly rusted and broken, so the bumper was just being supported by the center mounts on either side of the door. When I crawled underneath to start removing the bumper, I also noticed that the rear fiberglass cap was also completely destroyed on the bottom on both sides. It looked like the back end had crashed down on something solid, or was backed into a curb. On closer inspection, I discovered that the previous owner had filled in the holes with old clothing and spray foam to try and keep the dust and cold out. Also you can see that the tail light lenses are broken, and some of the lights were not functioning correctly. This was the worst piece of rust on the entire van. And it is hard to see in this picture, but the fender flares are badly cracked and broken. 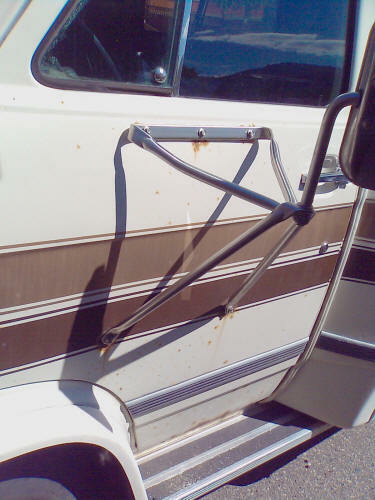 The doors were rusty but it was all surface rust. Dents and rust on the hood, and a lot of rock chips. 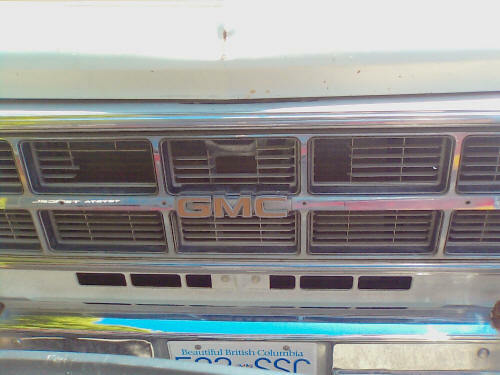 The grill was missing some fins and the chrome trim rails from the middle. The clearance lights were all broken and badly faded, and only a couple of them would even light up. The front cap had shrunk slightly, had come away from the roof, and it was leaking as well. 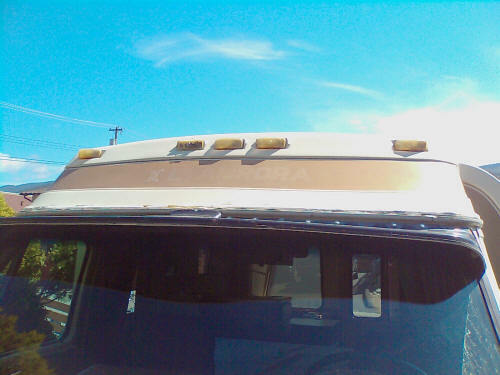 The paint on the visor was faded and peeling, so It will also be removed and painted to match the rest of the van. You can't see it in any of the pictures, but the roof vent was badly damaged, and was being held together with Duct Tape. So it will have to be completely replaced.